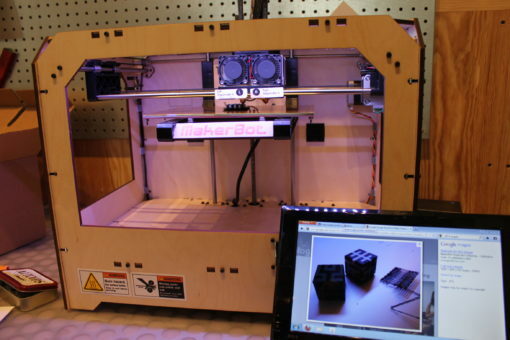 We have a new toy in MAKESHOP — a MakerBot Replicator 3D printer! It’s on loan to us from the Entertainment Technology Center at Carnegie Mellon University, and we finally broke it out to play with it! Calling this machine a “printer” isn’t entirely accurate: this isn’t a printer like the one on the corner of your desk or even like the fancy-schmancy ones at the copy shop. 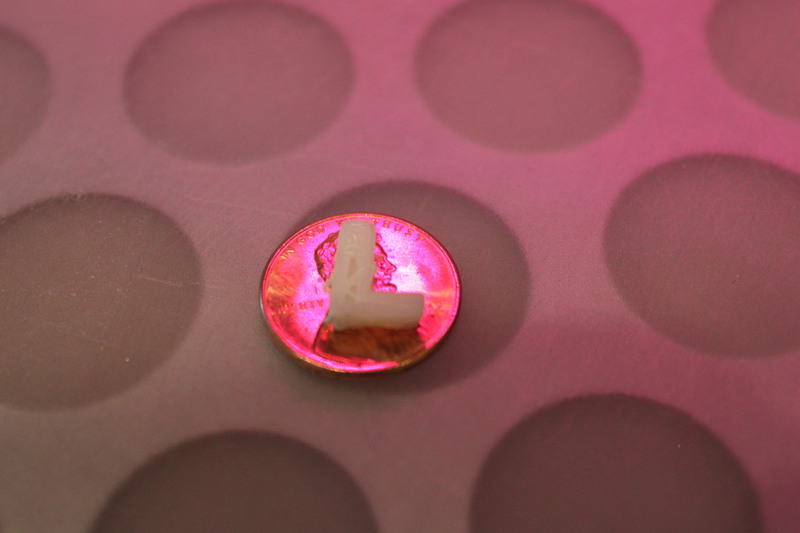 This is a actually an additive manufacturing machine, that uses fused deposition modeling to create objects. Confused yet? Don’t be! Think of it as a really, really fancy, computer-controlled glue-gun. But instead of glue, it uses plastic! See the big white thing in the back of the Replicator, and the black one next to it? That’s not string, but a spool of long, thin plastic. It’s ABS plastic, the same stuff LEGOs are made of. 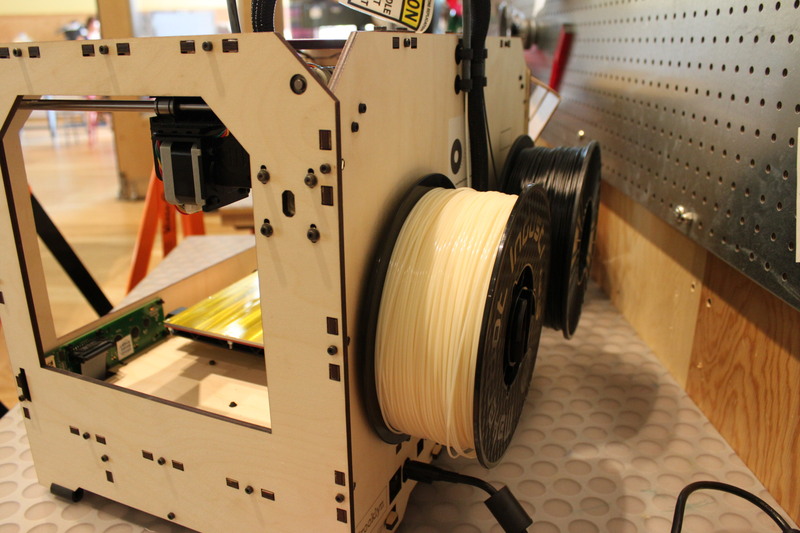 The ends of the plastic filament are put into tubes, which carry it up over the top of the machine and into the “stepstruders”. Our printer has two of these, so we can use two different colors at the same time. 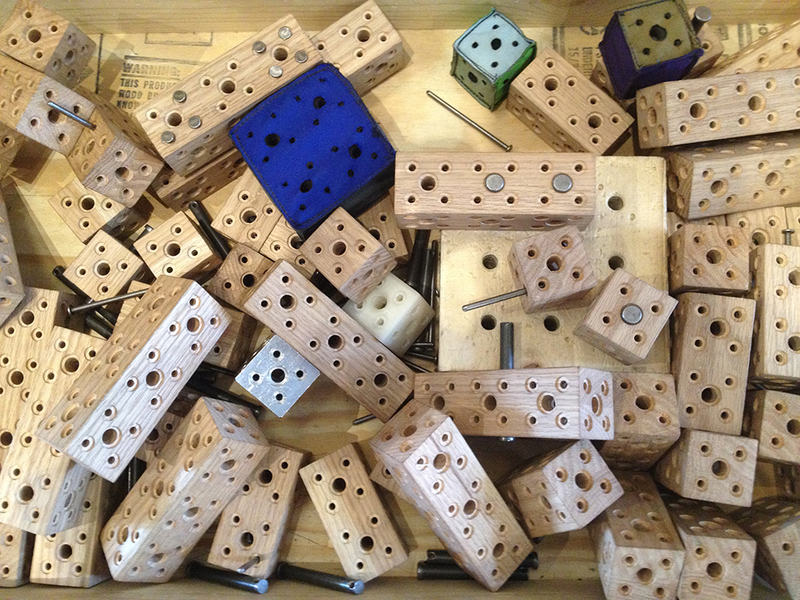 They’re named “stepstruders” because they move step by step to extrude, or push out, plastic. The tip of each one is heated to about 220°C/428°F, which is almost hot enough to set fire to paper. This makes the plastic filament soft and sticky without burning it. It’s pretty gooey, like a perfect chocolate chip cookie. 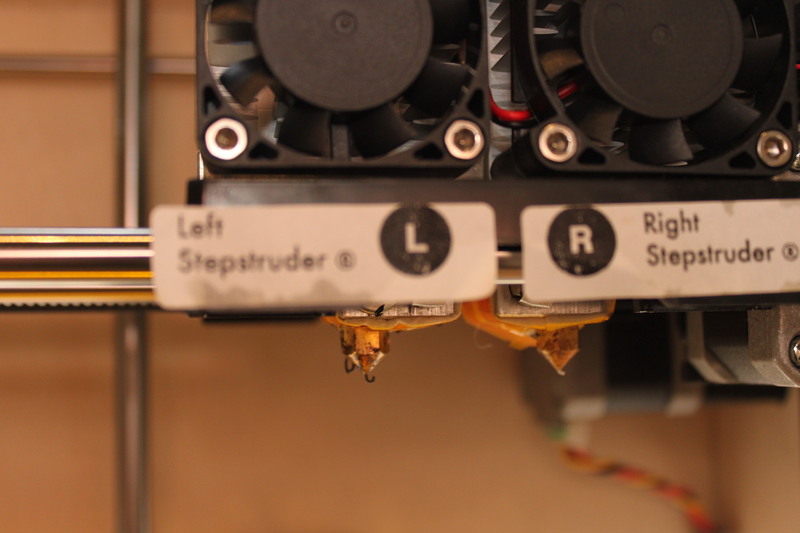 The stepstruders are on metal bars and can move from left to right, and front to back. They’re controlled by a small computer inside the Replicator. 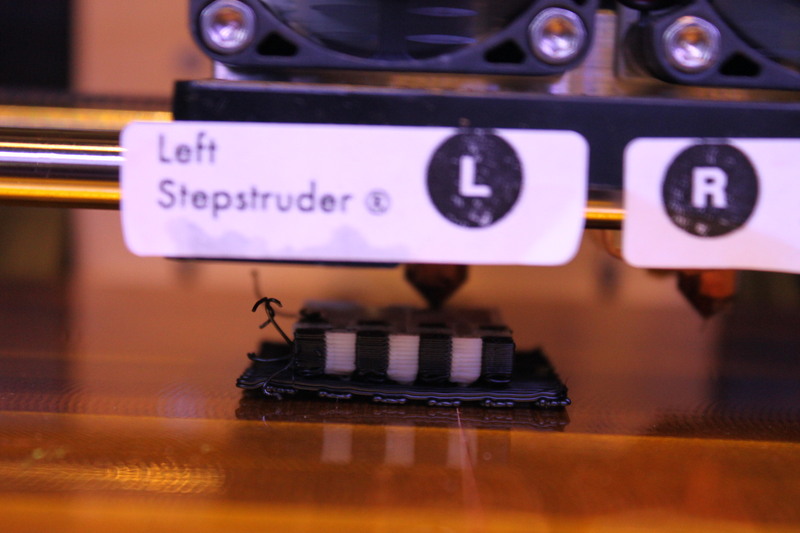 The stepstruders “draw” a flat layer of plastic in whatever shape the computer tells it to. Then, the platform that it’s building on (which is also heated, to 110°C/230°F) moves down just a little bit. This gives it enough room to make another layer, on top of the first. As it draws and moves, draws and moves, it makes more and more layers, until you’ve built something in 3D! This was the test print that we did this morning, to calibrate the machine, or make sure that everything is lined up exactly right. I photographed it with a penny so you can see how big it is. 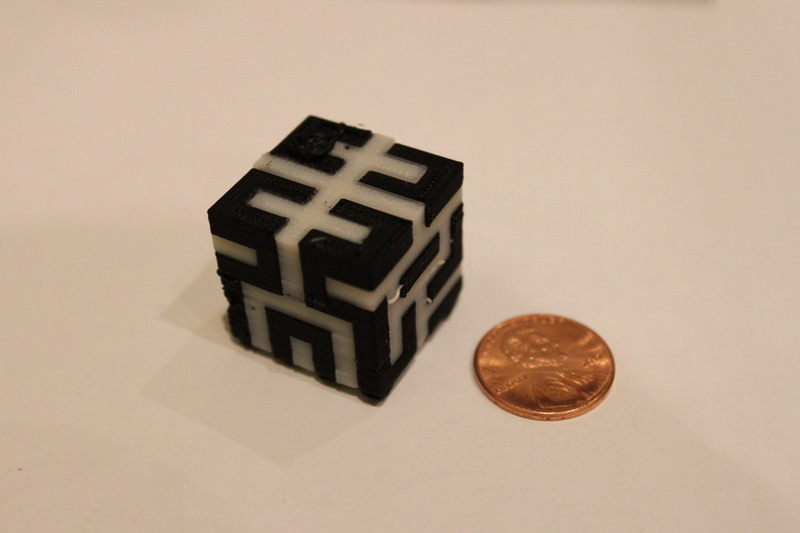 Even though it’s only a small cube, it took around an hour to make, because there are two colors and they make a complicated pattern. The printer had to “draw” the white part, then the black part, and then start again on the next layer. 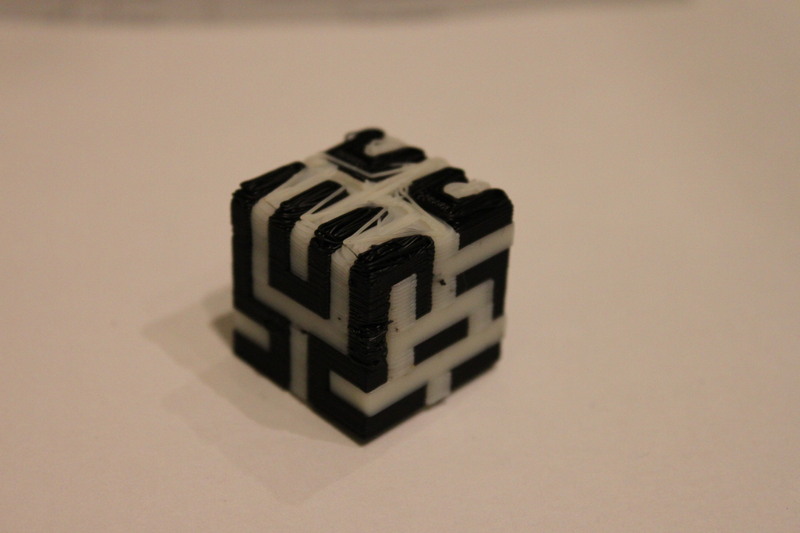 The second picture is the bottom of the cube. You can see that it’s not very pretty looking — the plastic wasn’t sticking to the platform very well, and was moving around a little bit. It got better the more it printed, though. Two girls, L and R, were taking apart some electronics while I was getting the MakerBot set up. I asked if they wanted to try to help me out and design another test print. We booted up TinkerCAD to play try to make a 3D object. After being a little distracted by the cool featured models, I encouraged them to try to make something more personal. They ended up selecting pre-made letters, and just wanted to try printing their initials. The prints were so small that we were having trouble getting them to stick, even though the stepstruders and the platform were already clean and hot. 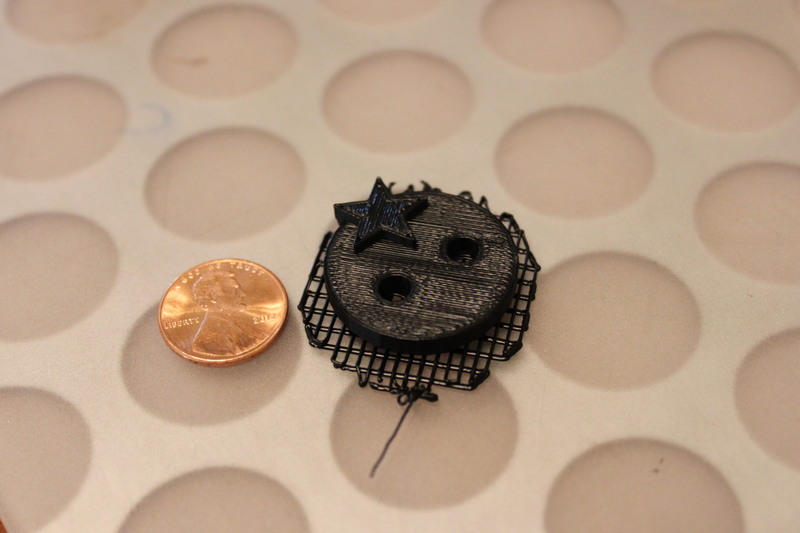 I decided to test something a little larger, also made on TinkerCAD, to see if I could get better results. I made a large button with a star on it. The crisscrossed lines under it were easy to pull off — they’re there to help give it some support and help the whole thing stick to the platform better so it doesn’t move around while printing. I had the same problem I had on the cube: the bottom layers were messy and uneven, but once it got going it evened out, and the top layer looks beautiful. It was super fun to set it up and get it working today, and our visitors seemed interested in knowing what it was doing and how it worked. I think we have a long way to go in figuring out how we can best help visitors learn how to model their own designs, but we have some ideas that we might be able to try in the future. We also have a team of grad students from the ETC who are going to help us work on this problem this fall. We may not be running MakerBot every day, but keep your eye out for 3D modeling and printing at MAKESHOP in the coming months!